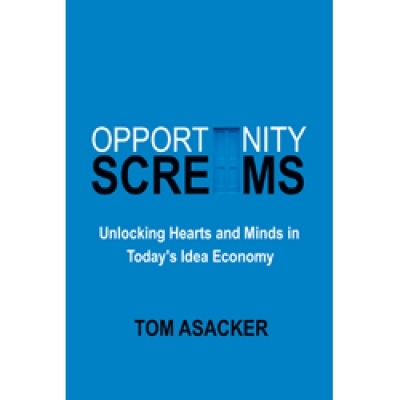 "Opportunity Screams by Tom Asacker"
Opportunity Screams: Unlocking Hearts and Minds in Today's Idea Economy by Tom Asacker argues that the leaders of the future—the winners in the marketplace of ideas—will be those who master the distinctions of that marketplace. In this eye-opening little book, the author demystifies today's rapidly changing marketplace and makes the hidden, yet essential criteria for success, viscerally clear. Says Tom Peters,"When Tom Asacker writes, I read. Opportunity Screams is the right message for the right time." Customers want to be surprised, and to be proud that they are associated with you and your products. If customers believe you have their best interests at heart, they will be yours forever. This engaging and quick read will help you refocus your strategy for today’s shifting economy and motivate you and your colleagues to pursue your ideas with passion and daring as you uniquely add value to people’s lives. Do you understand how people make decisions in a marketplace exploding with options? Do you want to give your idea—whether it's a new business, a pitch to a client or boss, a breakthrough technology, or a worthy cause—the best possible chance for success? "There are doors, invisible metaphysical doors, to people's hearts and minds," Asacker says. "More importantly, there are specific keys and designs which will unlock those doors. I've spent the past twenty years decoding this seemingly incomprehensible mystery." Both a manifesto and a framework for success, Opportunity Screams is filled with insights and inspiration, examples and ideas. You'll learn from philosophers and playwrights like Goethe and Shaw. You'll be inspired by entrepreneurs like Disney and Jobs. Enlightening words from economists and management gurus, including Peter Drucker, Tom Peters, Michael Porter, and John Kay are sprinkled throughout. A host of entertaining stories about organizations and individuals will provide insightful lessons, includng well-known brands like Southwest Airlines, Volkwagen, Muhammad Ali and Jamie Oliver as well as less familiar ones like New Pig, Gary Vaynerchuk, and Hugh MacLeod. 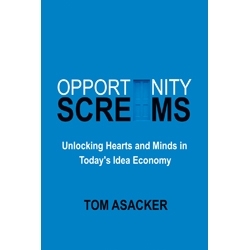 A special feature of the book is keywords that, when typed into a search box at www.opportunityscreams.com, launch short videos by Tom that will further explore the topic at hand. At every corner, Opportunity Screams. It screams for more creativity, caring, and laughter. It screams for more meaningful and exciting organizations and experiences. And it's screaming for you to let go of your past and grab onto your future. Our modern marketplace is awash in desperate attempts to attract people's attention. Unfortunately, attention is a flimsy concept. It's not built to last. We need a new way of thinking about how to connect with our audience; one that brings life to our ideas and brings our ideas to life. We view the world through the lens of our own fears and desires, and this selective perception makes us focus on ourselves and our concerns. Success comes from opening our eyes, and our hearts, and connecting with others for their benefit and for ours. Our relationship with our audience is based on nothing more than belief . . . and nothing less. Our belief in our ability to continuously surprise them, feed their hungers, and make them feel proud of their association with us. And their heartfelt belief that we can. Now is not the time to "go along to get along." It's time to think very practically about how to uniquely add value to people's lives, and pursue those ideas with passion and daring. We are our ideas put into action. The Doors we open in the marketplace determine the destiny of those ideas. If you would like to share this book with colleagues or clients, please call 888-787-8100 for special quantity discount pricing.